Londonist has designed the Cornershop Christmas Hamper for those who really can't be bothered this year. Perfect for assembling on the way to a party you're only going to because you want to get your DVDs back, this is a gift that captures the spirit of modern Christmas. Indifference to the true meaning of the festive season unites all the items; desperation adds the perfect finish to this gift of last minute panic. The pressure of finding perfect presents for imperfect people is unbearable and inevitably, your gift will reveal too much about your inappropriate lust, contempt or unalloyed hatred for the receiver. Why bother? Wouldn't your time and energy be better spent planning how to cop a feel of your office crush at the works Christmas party? Wouldn't you rather be attending four drinks parties prior to the family Christmas dinner? (Clockwise from left) 100 cocktail sticks: There is no real reason why 100 cocktail sticks should be included in any Christmas hamper. 6 household candles: With the threat of terrorism in our country, having six household candles in the house should reassure any nervous citizens that everything will be alright in the end. Complements the blue lighter in the hamper very well. Dr Pepper Zero: Nothing beats the wretched taste of this vile soft drink. Nothing, not paracetamol, not EU regulations, not common decency, not antibiotics. It's like herpes in a can. Note the "Zero", as in "Coke Zero" for people who are deterred by the word "diet". Zero also means Loser. Dr Pepper Loser. You're drinking Dr Pepper Loser. Loser. Happy Christmas. Superglue: No reason why we thought this was a good addition to the hamper. We were desperate. It was a better option than the can of dog food we initially picked up. It was 11.30pm. Superglue is really useful. Merry Christmas. Jaffa Cake Mis-Shapes: We are not making this up. Cakes only a mother could love. Why not give them to your mother? Actually, better not, think of the inheritance. Mint Aero Family Size bar: Huge. Bubbly texture. The only case in which it is acceptable for adults to eat bright green chocolate. A bargain at £1.00 for a massive slab. Bulk-buy if necessary as this is a limited offer only. Usually kept in prominent location near the main entry to the shop or near the till as a final impulse purchase. Cigarette lighter: For cigarettes, lighting gas stoves, arson, crack, smack or dope. An invaluable tool for all your drug abuse and vandalising needs. Extra Ice Sugar Free Mints: Like the chewing gum but better: refreshing minty taste, sugar free with breath-freshening properties, without the inconvenience of chewing gum that requires unseemly removal and disposal. Usually located conveniently next to the cash till. Anadin Extra 12 pack: The good stuff. Normally overpriced but it's Christmas. And you'll need it. The grand total of this lovely gift was £12.32 and most cornershops will offer a gift wrapping service. 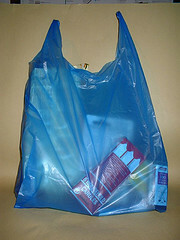 We chose this special presentation plastic bag - translucent and fragile. Useless over long distances or if transporting heavy goods. Perfect. The annotated Londonist Cornershop Christmas Hamper can be found on Flickr here. With thanks to Will Wiles from This Isn't London and to the staff at Nightspot, Warwick Way, SW1V. Previously: Punk Rock Baby, London in a Bag, Sultan's Elephant, Wardour to Bond, Cityscape Coathanger, Chinatown Christmas Hamper, Judge Dredd badge, London Shoes, This Isn't London: Santa's Crap.